There are three certified "Dolphin SMART" tours in Lee County: Banana Bay Tour Company, Tarpon Bay Explorers and Captain Brian's Observations on the Water. 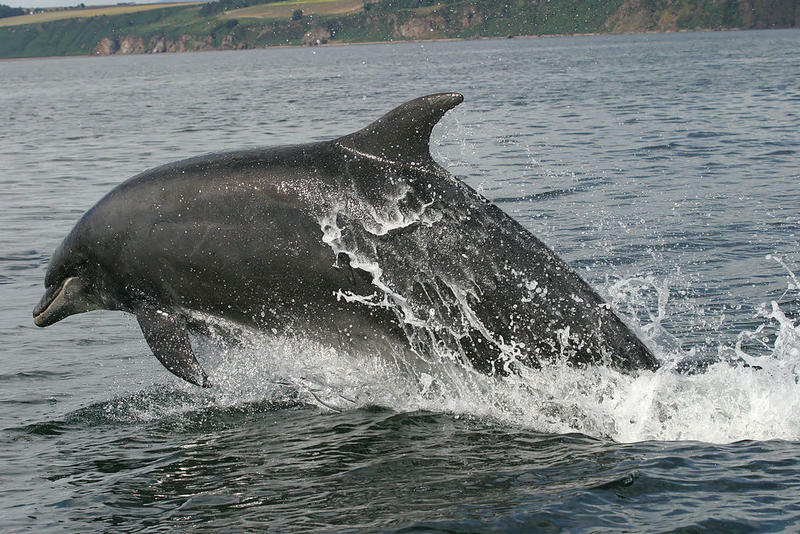 It’s common to see dolphins come up to a tour boat and jump in its wake. But there’s a growing campaign that wants ecotours to keep their distance. Across the country, there are 18 of these tours certified “Dolphin SMART." The program’s mission is to prevent boats from interrupting the natural behavior of wild dolphins. J.R. Trepper is captain of Banana Bay Tour Company that departs from Cape Coral. On a weekday afternoon, the skies were clear and the boat carried about 30 tourists. Trepper maneuvered out of the area’s canals, headed toward the Caloosahatchee River. He was on the lookout for Bottle Nose Dolphins, and he spotted some. "Dolphins are coming real close. I believe they feel we are not a threat because we're not even running the engines right now," he said. Shutting off the engines when dolphins are nearby is protocol for Trepper’s tour because it’s certified “Dolphin SMART” by the National Oceanic and Atmospheric Administration. The word “smart” is actually an acronym—stay 50 yards away, move away cautiously, always put your engine in neutral when dolphins are near, refrain from touching or feeding and teach others to be "Dolphin SMART." Cheryl Bonnes is with NOAA. She says the goal of this voluntary program is to prevent illegal harassment under the Marine Mammal Protection Act. "So anytime you change their behavior, that could potentially be harassment," said Bonnes. Some tours use their vessels to create wakes in the water. This attracts dolphins to jump in and ride behind them-- it’s kind of like surfing for dolphins. But Bonnes says wake riding has potential risks. 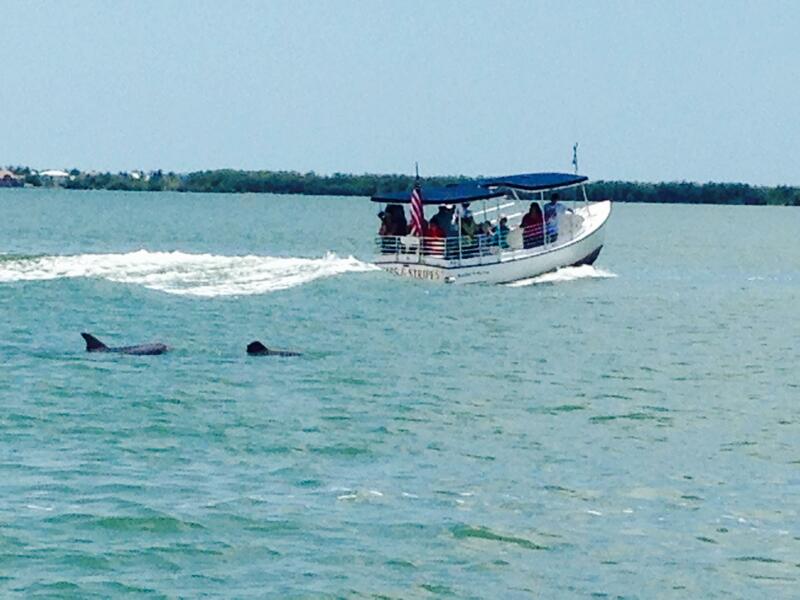 These Bottle Nose Dolphins are following the wake of "Stars and Stripes," a tour that launches out of the Sanibel Marina. The company's manager, Thomas McColgan, said, "The vessel makes a wake that Dolphins will occasionally swim behind and people enjoy that." "Anything from separating a mother and calf pair, interfering with their rest, interfering with their feeding. So you want to make sure they have enough energy," she said. There’s a total of 12 certified dolphin tours along the state’s west coast and the Florida Keys-- only three in Lee County. But there are no statistics right now proving the program has made any difference since it started in 2007. Regardless, Captain J.R. Trepper of Banana Bay Tours participates in yearly "Dolphin SMART" trainings. It’s where he gets updated safety information. As Banana Bay tourists observed a group of dolphins from about 50 yards away, Trepper spotted another local tour boat approaching a pod of about 12 dolphins. "Another thing you should never do is block the path of the dolphins, and you're seeing that right now by the way," said Trepper. "Looks like they are making a wake for the dolphins, so you can see what’s happening here. Yeah, that's not good for the dolphins." But not every tour operator feels this way. "It may well be dangerous for them, but personally, I think they’re just having some fun," said Harry Julian, owner of an ecotour called Pure Florida that operates out of Fort Myers and Naples. Julian said he hasn’t been approached by "Dolphin SMART" yet, but he’s done his research. "Is there a need for everyone to have it? I don’t think so," he said. He said it’s a good program, but if every vessel stops when dolphins get close, it could be dangerous for boaters. "We operate in narrow, congested waterways-- lots of other boats, lots of dolphins," said Julian. "If we act differently from anyone else there, we’re gonna be putting our boats and customers in a position of maybe having a collision or something with another vessel." Julian said he does not want to sign up for something that he couldn’t absolutely abide by. He said he relies on the dolphins for his business and he respects them. "We don’t feed them, we don’t bang on the side of the boat, we don’t try and run ‘em over or anything like that," said Julian. "The dolphins frequently come to us. They like playing in the wake." He said it’s a partnership with the dolphins. But for Banana Bay Captain Trepper, his partnership with the dolphins includes "Dolphin SMART." "In my heart, I understand that I am doing the best possible dolphin viewing that I can and not impeding the dolphins," said Trepper. In a new study, a team of scientists says there’s a definite link between the massive BP oil spill in 2010 and a record number of dolphin deaths along the northern Gulf of Mexico. The scientists said large numbers of dead bottlenose dolphins found stranded along shores since the spill suffered from lung and adrenal lesions caused by swimming in oil-contaminated seas. 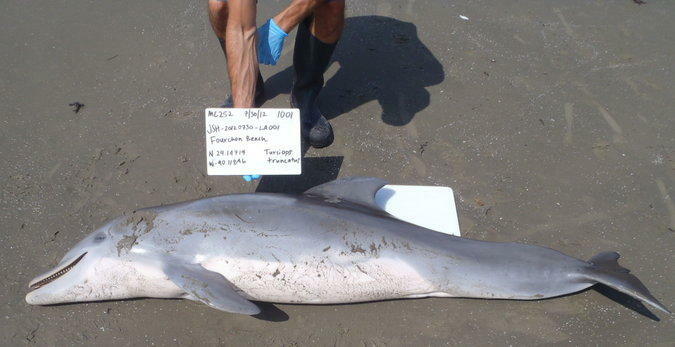 The research paper backs up previous findings linking dolphin deaths to the oil spill. Dolphins infected with a deadly virus have been washing ashore by the hundreds all along the U.S. Atlantic coastline. 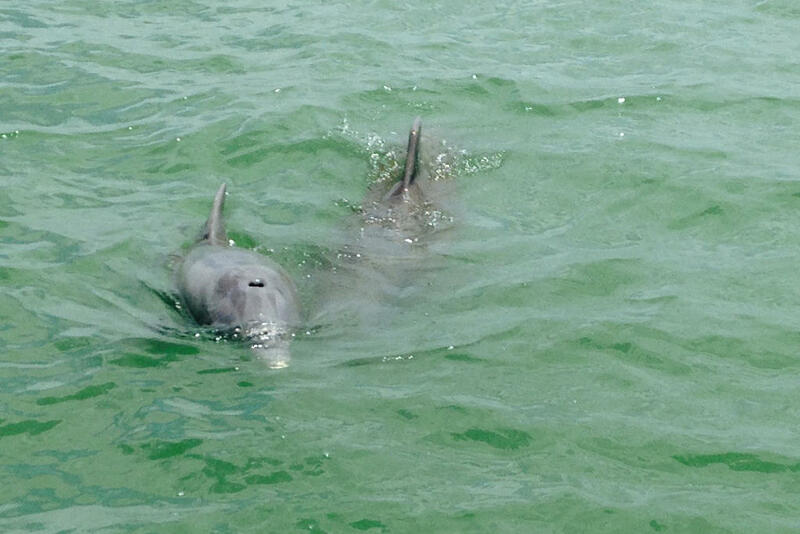 The virus has now spread to bottlenose dolphins in the Indian River Lagoon. Florida Today reports that on average about 26 dead or stranded dolphins wash up in the Indian River Lagoon area each year, but that researchers documented 18 dead dolphins in the region in the month of August alone. We’ll explore impacts of the virus and ongoing efforts to track its spread. What should be done to mitigate the spread of the virus killing Dolphins along the Atlantic Coast? 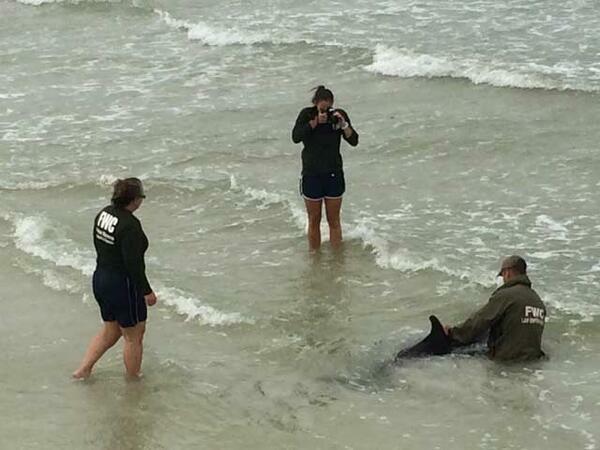 Two spotted dolphins stranded themselves on Fort Myers Beach and died Thursday. Photo by Sarasota Dolphin Research Program taken under NMFS Scientific Research Permit. A researcher in Sarasota is helping federal officials figure out whether dolphins were affected by the 2010 Deepwater Horizon oil spill. Mote Marine Laboratory in Sarasota contributed samples for a new study from an unusual dolphin species to the National Oceanic and Atmospheric Administration. Nineteen-year-old bones from clymene dolphins have raised questions for scientists studying marine mammals. 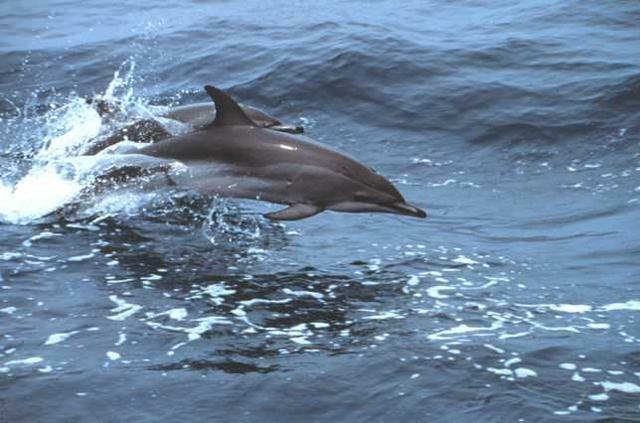 The Science journal PLOS ONE introduced the clymene dolphin, which is a hybrid species separate that arose from two other species. The bones were found after a mass stranding in 1995 in Tarpon Springs and taken to Mote’s marine mammal bone archive.